A major part of building a happy Christian family is staying connected to God and each other. Getting together for inspirational devotions is a great idea. But if you’re new to the concept, it can seem daunting. Don’t worry! Committing to engaging with your family in this way is the most important thing. Like every other element of life, it will probably not go perfectly; but with prayer and patience, you can create a meaningful devotional routine. The tips below will help you develop your own inspirational devotions that everyone in the family enjoys. It’s important that you develop a routine for your devotions. If you leave it up to the whims of your schedule, life will get in the way and it will never happen. Think about what time of day works best for your family. Do you all eat breakfast together in the morning? Perhaps the evening — after jobs and homework end — is ideal to gather. Commit to a time where you can give God and your family a few minutes of undivided attention. This may be difficult at first, but in time this habit will feel second nature. Life has a way of throwing curveballs at us. Unexpected meetings or obligations arise, making it challenging to maintain our schedule. If your normal devotional time is interrupted for whatever reason, all is not lost! Embrace flexibility and do your devotion when you can. Sometimes you just don’t feel like it. Especially if you’re leading the devotion, there can be days when it seems like more of a chore than a pleasure. This is normal. The quality of your devotion depends on your attitude. You can use feelings of failure and tiredness as moments of honest reflection with your family to turn negative emotions into valuable lessons. Lead by example first. Your family will get the most from your guidance if they see the positive effect your inspirational devotions have on you. Consider these tips to help you bring good spiritual energy to your devotion every time. The bedrock of your devotions should come from the Word of God. Going through passages and learning from the teachings of Christ provide great instruction and opportunity for engagement. But even if you’re a bible scholar, you could benefit from additional resources that add context and color to your devotions. Using a guide full of well-constructed family devotional lessons can provide a roadmap for extended study. You’ll be able to build off the insight gained the day before to develop a powerful understanding of God’s plan. Inspirational devotions should spark conversation. The scriptures offer many thought-provoking insights and diving deeply into them should generate powerful discussions. As you build your lessons, keep your family engaged by making time to explore the questions and viewpoints that arise along the way. Be prepared with your own questions to help drive discussion if it feels lacking. If there are issues of particular importance to a member of your family, allot time in your devotion to bring them to the forefront. The more ownership everyone has over the devotion, the more they’ll participate and ultimately benefit from it. As the devotion leader, you’ll be expected to have the answers. To be able to properly guide the conversation, you must already be familiar with the text you’re using and able to anticipate some of the questions or comments the rest of your family will have. Invest in a great study bible so you can understand the historical context and the intent of the biblical authors more completely. This will add layers of meaning to your discussions. Be prepared, but know that it’s OK to not know everything. Seek answers from your pastor or other trusted spiritual advisor if questions arise in your devotions that are beyond your understanding. Just because you’re doing something spiritually-minded doesn’t mean that it has to be sterile or boring. To the contrary, family devotion time should be fun! The goal is for your family to want to gather and, in doing so, grow closer to God and each other. Think about what you all enjoy as a family. Incorporate songs, games, or stories into your devotion. And there’s no rule that says you have to meet inside in the family room. Perhaps your family would prefer to connect outdoors, in nature. Talking and walking may bring the most fruitful conversation. If you’re on a family vacation, think of fun ways to build your inspirational devotions into your activities. Don’t make it feel like you have to take a break from enjoying yourselves to worship. One way to keep your devotions feeling relevant to your family is to talk about current events. Holidays provide great devotional opportunities. There’s so much confusion in the world about the real meaning and value of Christmas, Easter, and other holidays. As you celebrate them, instill Godly virtue in your family by focusing on their spiritual significance. Even secular holidays and birthdays can make great foundations for conversation. Consider the calendar as you’re planning your inspirational devotions. 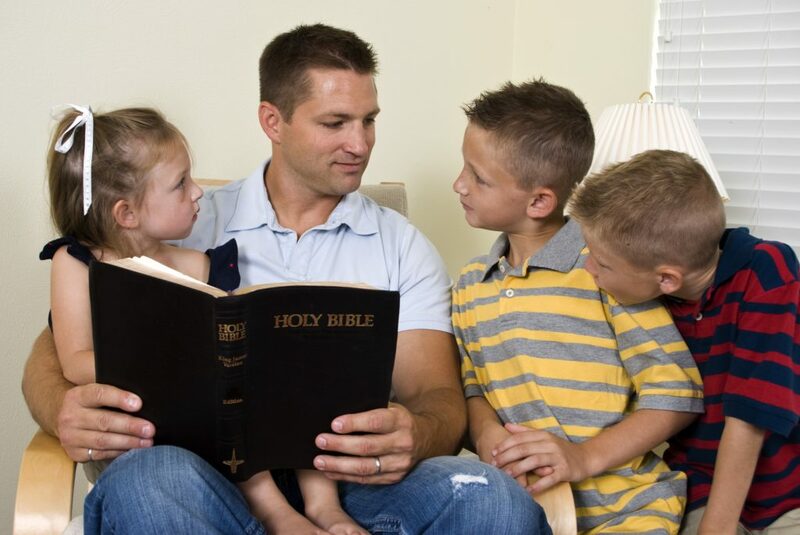 Ultimately, the key to having inspirational devotions with your family is to commit to doing it. There’s no magic trick. It’s just like every other aspect of your Christian life. Some days will be easier than others, but you have the God-given ability to accomplish anything you set out to do. Before long you’ll see the benefits of your family devotions. It will not only improve your collective walk with God, it will improve your relationships with each other. Spending time praying with and for each other, listening and sharing opinions without judgment, and carving out a specific block for undivided attention is the perfect recipe to build a well-connected family. Interested in other tips and church-related advice? Check out our blog and join the conversation! Previous PostPrevious What Are The Benefits Of Prayer For Recovering Addicts?